In our commitment to helping you stay beautiful while caring for your skin, we have put together and reviewed 5 of the best face wipes in the market today. We then picked what we think is the best face wipes for oily skin based on the products’ ability to remove excess oil and dirt, ability to remove makeup, gentleness on the skin and its affordability. The Facial Cleansing Towelettes, Pink Grapefruit by Burt’s Bees is a 99.1% natural towelette. Dermatologist and ophthalmologist-tested, they are petrolatum, phthalates, and paraben-free. 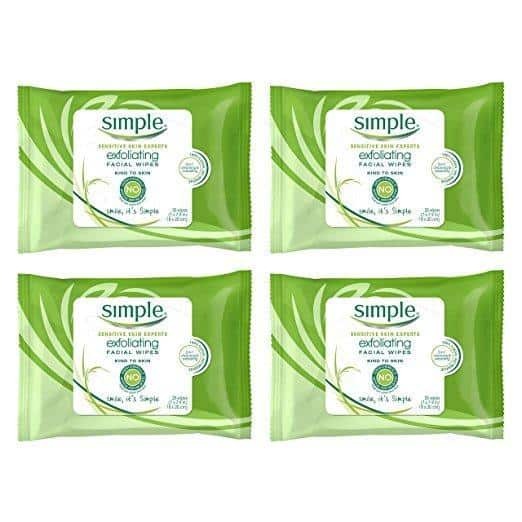 Simple’s Exfoliating Facial Wipes has two sides: an exfoliating and a cleansing one. It is also one of the winners of the Allure Best of Beauty Award in 2015 for the cleansing wipes category. Lovers of organic products should try the Daily Combination/Oily Towelettes﻿, ﻿Tea Tree Oil by Blum Naturals﻿﻿﻿. These towelettes contain Tea Tree Oil which is known to be effective against oil. Those who love textured wipes should try Olay’s Daily Clean 4-in-1 Daily Facial Cloths. Soap-free, each cloth contains the power of a cleanser, toner, and scrub to deeply exfoliate skin. Garnier’s The Refreshing Remover Cleansing Towelettes is a 100% oil-free cleansing wipe. Infused with Grape Water Extract, it instantly gives a healthy look by revitalizing the skin. Here, our beauty editors discuss the best face wipes for oily skin. Its citrus oil component makes this one of the best face wipes for oily skin. Rejuvenating and refreshing, citrus oil is a natural astringent that cleans deep without over drying. People with oily skin would really benefit from this because it lifts dirt and oil trapped in the pores. It also contains pink grapefruit, which leaves skin soft and feeling clean. Dermatologist and ophthalmologist-tested, this product is safe for everyday use. These face wipes are 99.1% natural, and contain no petrolatum, phthalates, and parabens. This product only uses FSC-certified cloths. It is a plus for those who love the environment, because it means you’re not using anything toxic and is doing Mother Nature a favor. These towelettes are perfect even for those with sensitive skin. It may also help calm irritated skin, and according to a reviewer, can help with the discomfort of hot flashes. This is one of the best face wipes for oily skin because it leaves no residue after every use. Safe for everyday use, it only leaves your face clean with its dual cleansing and toning action. Its ability to remove oil, dirt, and dead skin cells makes this one of the best face wipes for oily skin. It also contains two added Vitamins to help restore and protect the skin. What makes this product great is that it features two sides The first side does all the exfoliating and the “dirty” work, while the cleansing side helps leave the skin soft and smooth. These face wipes also contain Aloe Vera, which helps soothe and condition skin. With every wipe of this product, your skin always gets the love it deserves.Along with other skin-loving ingredients, these wipes are infused with triple purified water. An ingredient unique to them, these towelettes provide the skin with instant hydration. This is one of the best face wipes for oily skin because it has everything your face needs. From pore de-clogging to moisturizing abilities, your skin will really thank you for using this product. This product contains Tea Tree Oil, which makes it one of the best face wipes for oily skin. Tea Tree Oil is good for oily skin because it dissolves oils stuck deep down the pores. That means no more clogged pores and a fresher and a more supple skin. This product bears the NSF mark, a mark that consumers must seek out. This mark is really hard to achieve, so having it in this product shows that what you’re getting is purely organic. Composed of soft towelettes, this leaves the skin pure and naturally clean. These face wipes can also be used to remove face makeup, and are gentle enough to be used around the eye. It also makes use of 100% viscose towels. So aside from staying and looking fresh the whole day, you’re assured that you’re still caring for the environment with every wipe. Hypoallergenic, this is one of the best face wipes for oily skin because it can be used by anyone. It is free from any irritants, so even those with sensitive skin can enjoy its benefits. A 4-in-1 product, this is no doubt one of the best face wipes for oily skin. It combines the powers of a cleanser, toner, mask, and scrub to cleanse the skin from within. A textured face cloth, this is great in removing excess oil, dirt, and makeup. It can also remove mascara, and claims to be twice as effective compared to regular cleansing. These towelettes also combine essential conditioners and a rich lather. This unique combination is needed for cleansing and hydrating the skin for a fresh look throughout the day. This product is perfect for daily cleansing and even for travel. Water-activated, you are ensured of a deep clean for smoother and more radiant skin. Formulated for combination/oily skin types, these towelettes are safe for everyday use. With its soap-free lather and secret conditioners, be ready to transform your skin in less than a week. This is one of the best face wipes for oily skin because it is really versatile. Everything you need is here, and it can really help you save a lot from buying varied facial products. What makes this one of the best face wipes for oily skin is that it is absolutely oil-free. It also instantly removes impurities, and won’t cause clogged pores. This product offers customized cleaning with its soft towelettes. Infused with Grape Water Extract, your face is instantly revitalized for a healthier appearance. We really love how this product promises to deliver fast results. Skin is deeply cleansed after the first use, and after one week, is bound to feel healthy and revitalized. These wipes are also deeply moisturizing without leaving a sticky feel. It is gentle enough for everyday use, and above all, smells great. The only downside to this product is its self-stick opening strip. It can easily tear in the wrong direction, which makes the remaining towelettes prone to drying. This is one of the best face wipes for oily skin because it helps balance the skin and improve skin texture. The towelettes are also thicker and very saturated to give you that deep clean. Though convenient, face wipes have been getting a lot of hate in the beauty world recently. Some argue that they are not as efficient in removing dirt and in cleansing your face in general. To put an end to this debate, let’s take a closer look. For oil, dirt and makeup-removal, facial cleansers and face wipes are both effective choices. However, cleaning your face with a cleanser and water is probably a wiser option. Facial wipes may have ingredients that can get rid of oil and other impurities but they won’t be able to deeply penetrate your pores. Cleansers, with the right ingredients, can pull out the factors clogging your pores. As a result, you’ll get a much deeper clean which you need to avoid skin breakouts and acne. Face wipes are perfect in removing excess oil, sweat or makeup from time to time. Just use them occasionally and never use them in place of your regular cleanser. The answer to this is obvious. Face wipes are a great help if you’re on-the-go or just too busy to do a full skin care routine. While it’s still recommended that you wash your face with a gentle cleanser, doing something is still better than nothing, right? If possible, immediately rinse with water after using a wipe. This step gets rid of those irritating and drying ingredients that were possibly left behind. Avoid the vermillion border of the lips and the eye area when using wipes. These are delicate areas of the face, and can easily get irritated. Stay away from wipes containing formaldehyde-releasing ingredients, and opt for those that contain phenoxyethanol instead. For oily skin, avoid wipes that leave a filmy residue on your face because it probably means it has extra moisturizers in them. They work for dry skin, but definitely not for you. Avoid wipes that has perfume in it, as fragrance is a known skin irritant. Face wipes are really a must-have for people with oily skin. You’ll never know when your pores will break out, so it’s better to be safe than sorry. Plus, they are really convenient and easy to use. You can always keep one in your bag and use them whenever you feel like you’re getting shiny. We chose the Facial Cleansing Towelettes – Pink Grapefruit by Burt’s Bees as this roundup’s best face wipe for oily skin. These wipes cleanse away pore-clogging dirt for naturally clean skin. It is also safe for daily use, and contains Citrus Oil. A natural astringent, this rejuvenating and refreshing oil deep cleans without overdrying the skin. I’m obsessed with face wipes. They’ve come in handy after late nights out and whenever I’m too lazy to properly wash my face. What I really love about them is that they don’t leave behind that gross layer of slime like other cloths I’ve used.